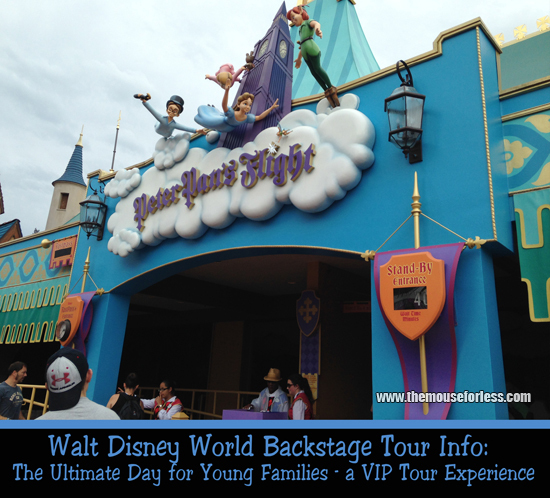 Want to experience a different side of the Walt Disney World Resort? 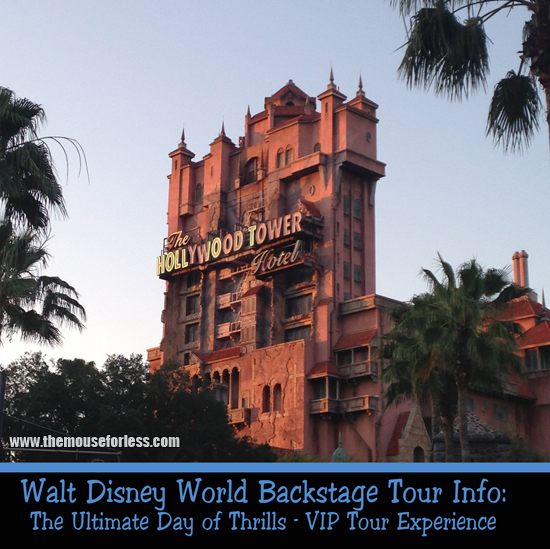 A variety of unique Backstage Tours and Experiences are available. Reservations are required for most tours. Unless noted otherwise, tours can be reserved 180 days in advance with a credit card. Full payment is due at the time of booking. 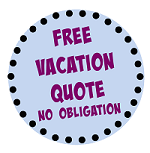 Cancellation must occur 48 hours in advance so you avoid forfeiting the entire price of your tour. Park admission is also required for most, but not all tours. A photo ID will usually be required when checking in. Many tours have a small number of guests touring each day, so book early to get the date you desire. Photographs are prohibited in backstage areas. Call (407)WDW-TOUR for reservations, unless otherwise noted. This tour will explore how events in Walt Disney’s life helped shape the Walt Disney World Resort and the attractions within it. As one of Walt’s final visions, the Magic Kingdom Park shares many similarities and likenesses to the storyline of his life. While using the park as a walking timeline, guests will discover how the events in Walt’s life helped develop his understanding and view of the world around him. These events also inspired him to create some of the most wonderful and cherished stories and attractions in the theme parks. During this 2.5 to 3 hour walking tour, guests will also get an insider look into the operation and design of some of the most beloved attractions in the Magic Kingdom Park. Restrictions: 12+ (guests must be a minimum age of 12 to participate); however guests under 18 must be accompanied by a paying participating parent or guardian. Photo ID required. Starting Location: Report to Town Square Theater, just inside the Magic Kingdom Park entrance. Guests must arrive 15 minutes prior to the start of the experience at the check-in location. Guests should wear casual clothing and also walking shoes. Railroad enthusiasts get an insider’s look while the Magic Kingdom theme park train crew prepares the Walt Disney World Railroad steam trains for their daily operation. Enter the park before opening and see the backstage roundhouse where the trains are stored and serviced. Your guide also shares with you how Walt Disney’s lifetime love of steam trains led to his decision to give them a starring role circling Magic Kingdom theme park. Restrictions: Ages 10 and up. Photo ID required. Starting Location: Report to Guest Relations window outside the main park entrance at 7:15 am. Tour is primarily outdoors. Check with your Resort Concierge for transportation options, however guests are responsible for their own transportation costs (e.g., taxi fare).. Guests opting to drive their personal vehicle may park at Disney’s Contemporary Resort and then walk to the Magic Kingdom park entrance. Please provide your confirmation number at the security kiosk at Disney’s Contemporary Resort. Guests join their family and friends on a guided interactive quest to save Magic Kingdom theme park from the dastardly plans of a Disney Villain. During this tour, test your knowledge of Disney trivia as you follow tricky clues, solve diabolical puzzles and engage in a lively scavenger hunt. If you manage to foil the plans of the forces of mayhem and save Magic Kingdom theme park, you will be treated to a very special surprise. Restrictions: Ages 3 and up. Although best for guests 4 to 10 years of age, however guests 16 years of age and under must be accompanied by a paying adult (18 years of age or older). Starting Location: Report to Town Square Theater at 9:45 am. Walking tour is primarily outdoors. 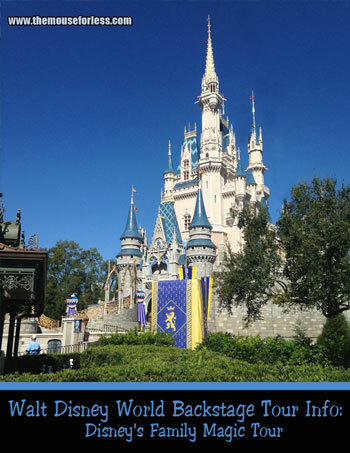 To Reserve: Call (407) WDW-TOUR or (407) 939-8687; Same-day bookings are available on a walk-up basis only. 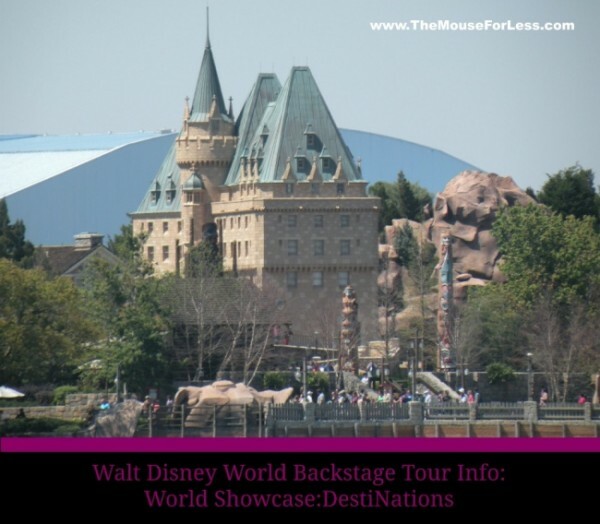 Highlights the fascinating history of Walt Disney World Resort and also provides backstage access to secret areas of Magic Kingdom theme park. 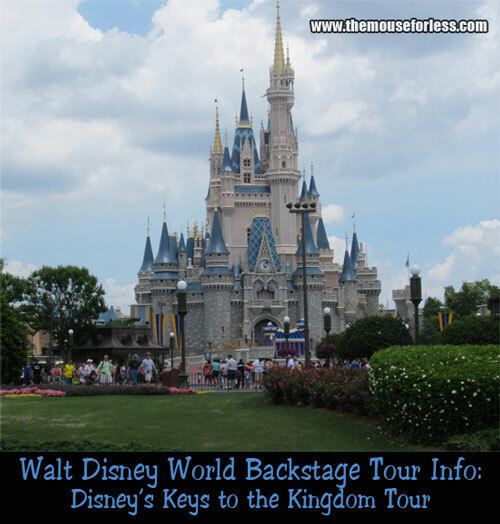 Includes stops at backstage facilities and a variety of favorite attractions, plus a trip below Magic Kingdom theme park into the service tunnels known as the Utilidors. Guests will be provided with Disney issued listening devices. Price Range: $79-99 per person, plus tax; includes lunch at Columbia Harbor House. Restrictions: Ages 16 and up. Photo ID required. Also, cameras, video equipment and cell phones may not be used throughout the duration of this tour. Photography is prohibited during the tour–even in the park. Starting Location: Report to Town Square Theater 15 minutes prior. Walking tour is primarily outdoors. 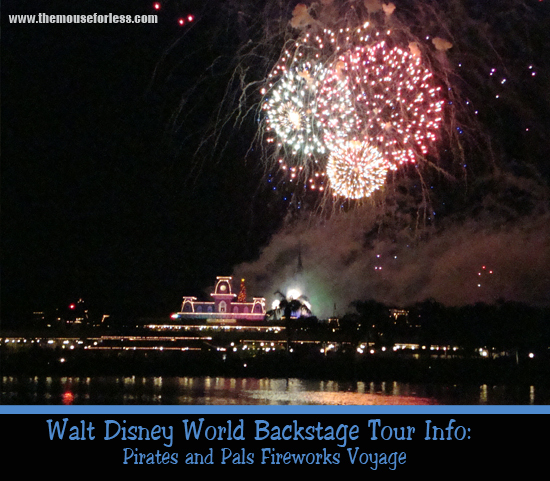 To Reserve: Call (407) WDW-TOUR or (407) 939-8687. Same-day bookings are on a walk-up basis only, based on availability. Description: When you go on an Ultimate VIP Tour, your VIP Tour Guides will attend to every detail as they plan the experiences for you. You will be granted special access to at least 10 attractions which will reduce wait times. These attractions may include: Pirates of the Caribbean, Jungle Cruise, Dumbo the Flying Elephant, “it’s a small world”, and Peter Pan’s Flight. Plus, you will have a chance to meet Mickey Mouse. Restrictions: Please be aware that the tour’s customized itinerary may change depending on attraction availability and other conditions. There are no height restrictions for the attractions and entertainment featured on this tour, so it’s great for kids of all ages. Starting Location: Report to Center Street at Magic Kingdom park between Crystal Arts and Uptown Jewelers. Description: Step behind the counter of the food and beverage experience at Magic Kingdom park and enjoy VIP tastings of iconic Disney menu items. During the tour, Guests will be able to hear stories from the chefs who bring these delicious dishes to life at the Magic Kingdom, have access to backstage kitchens and other areas that have never been shared with Guests before, learn what goes into the creation and production of serving Guests at the most popular theme park in the world, and enjoy a few of these dishes along the way too, including some items that are still in development. Restrictions: Ages 12 and up. Photo ID required. Also, cameras, video equipment and cell phones may not be used throughout the duration of this tour. Tour members exhibiting symptoms of diarrhea, vomiting, sore throat with fever, persistent sneezing, coughing or a runny nose and/or discharge from eyes, nose or mouth that cannot be controlled by medication or jaundice (yellow skin or eyes) are prohibited from participating in the tour. Proper attire is required: heels, open-ended shoes not permitted; clog-type shoes must have a closed heel. Sensible walking shoes are strongly recommended. Short-sleeved or long-sleeved shirts are recommended. Menu selections are designed to appeal to a wide variety of dietary preferences and restrictions, however, modifications and substitutions for individual offerings cannot be accommodated. Starting Location: Report to Tony’s Town Square on Main Street USA at the Magic Kingdom. Description: A unique scuba diving experience inside the 5.7-million-gallon saltwater tank at the Seas with Nemo & Friends Pavilion in Epcot theme park. Scuba-certified Guests can swim with over 6,000 sea creatures, including sea turtles, angelfish, dolphins, eagle rays and sharks. All diving equipment is provided. Please bring a swim suit and, if you wish, bring your own dive mask, particularly if you have a prescription mask. Restrictions: All Guests must be SCUBA-certified and 10 years of age or older to participate. However, guests 10 to 12 years of age must be accompanied by a paying adult (18 years of age or older). You will need to provide proof of certification, such as a C-card or verification from a certifying agency. Guests can learn about and get up close with a school of dolphins at The Seas with Nemo & Friends Pavilion. First, talk to the expert trainers and researchers who work with dolphins every day. The tour concludes with a very special opportunity for an up-close interaction with a dolphin which is also perfect for pictures. Although not required, please bring a bathing suit if you wish to enter the water. You do not need to swim or be scuba certified to enjoy this program. Restrictions: Ages 13 and up, however guests under the age of 18 years must have a parent or guardian along with them on the tour. Description: The Seas Aqua Tour allows Guests to swim on the surface of the 5.7-million-gallon saltwater tank inside the Seas with Nemo & Friends Pavilion. Guests use a supplied-air snorkel system, and wetsuit gear but do not need to be scuba certified. 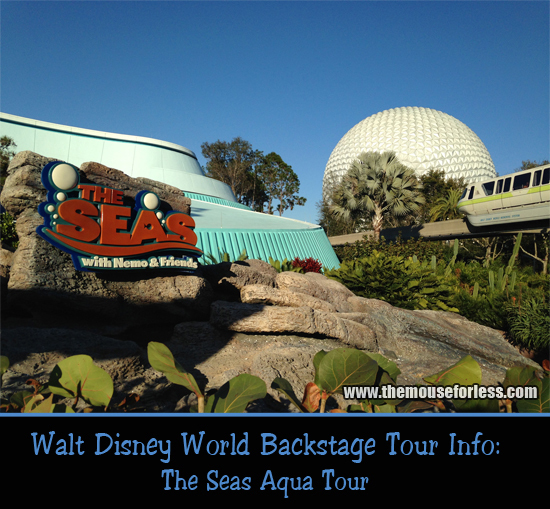 Participants also get to see the massive backstage infrastructure required to filter and maintain a vast manmade ocean flourishing with life, and spend some time with the aquarium’s two manatees. Please bring a swim suit. Participants receive a complimentary photo of themselves suited up in dive gear and take home a special DiveQuest souvenir. Price Range: $145 per person, plus tax. Also includes T-shirt and photo. Restrictions: Ages 8 and up, however guests under 12 must be accompanied by a paying adult (18 years of age or older). 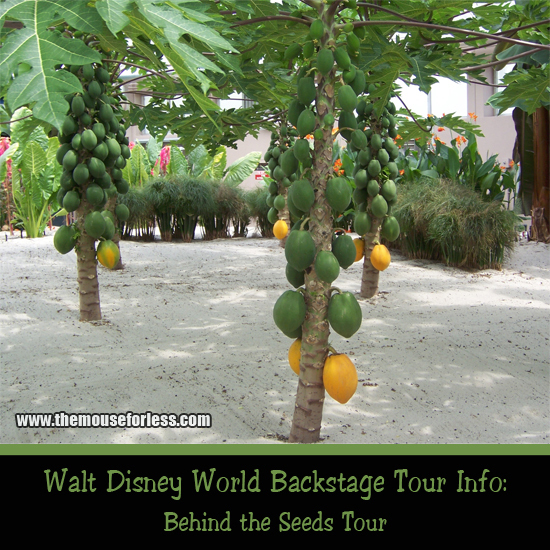 Venture into secret backstage areas of Epcot theme park where you will see amazing facilities that Guests are ordinarily not permitted to visit. Discover how Walt Disney’s vision and legacy inspired the design and technology behind the Future World area of Epcot theme park. Also, hear the amazing story of how a massive construction project brought Epcot theme park to life. 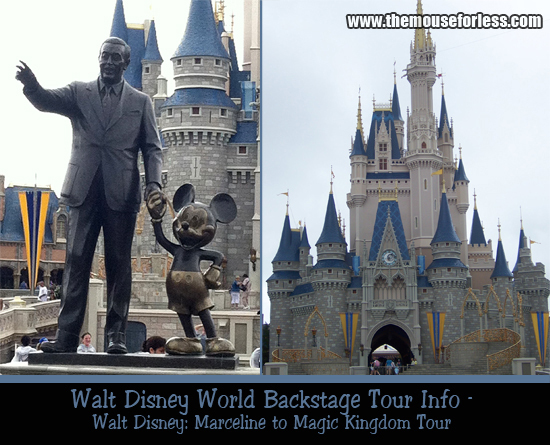 Guests will be provided with Disney issued listening devices while on this tour. All tour participants will also receive a complimentary commemorative pin! Restrictions: Ages 16 and up. Photo ID required. Also, no cameras are permitted backstage. Large backpacks are also not allowed on this tour. Starting Location: Report inside Fountain View, 15 minutes prior to your tour. Walking tour is primarily outdoors with no stop for food. See the future of agriculture in greenhouses and labs, go alligator gazing, release lady bugs and also learn the advanced and often experimental techniques used to grow hydroponic crops with little or no soil. You can preview this tour on the Living with the Land attraction. If you like what you see as your boat cruises through the greenhouse, you will love the this tour. Due to the backstage locations visited on this tour, videotaping is allowed. Read a first-hand report about this tour on our blog. See a special souvenir you can take home from this tour! Days & Times: Daily from 9:45 am to 4:30 pm, departing every 45 minutes. Restrictions: Ages 3 and up however children must be accompanied by a supervising a adult. Starting Location: Report to the tour desk on the lower level of the Land pavilion (near Soarin’) prior to your tour. Walking tour is indoors. Explore the culture, history and Disney magic that inspired animators to create some of the most beloved movie classics. During this walking tour, discuss four thousand years of architecture and world history in the World Showcase setting. Also included in the tour is lunch at Rose & Crown Dining Room. Starting Location: Report to Guest Relations window outside main entrance. 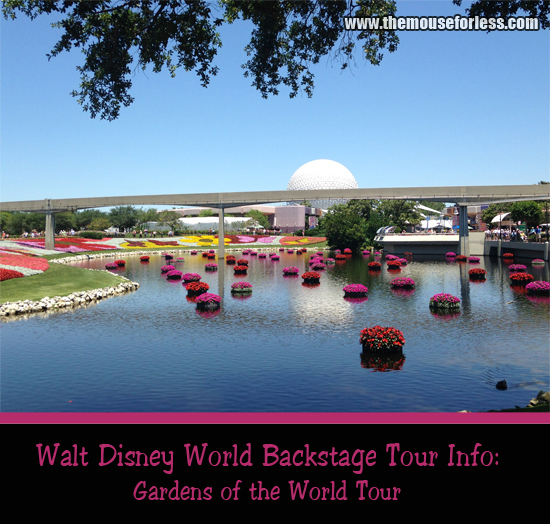 During this tour, guests receive an in depth look at the Flower & Garden Festival or Food and Wine Festival throughout Epcot. While enjoying the gardens on display, your guide offers amazing detail about the plants as well as the construction of the flower gardens, vegetable gardens, and topiaries. 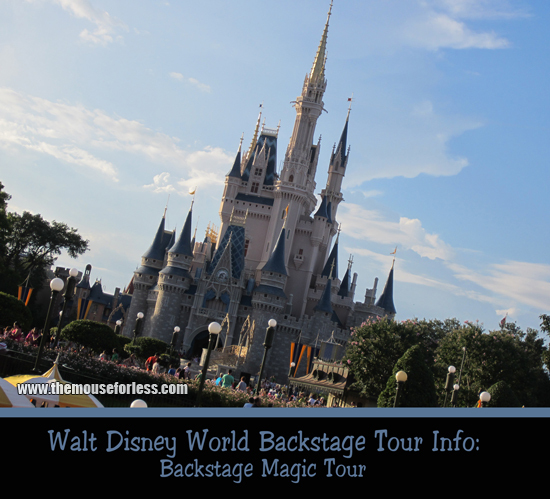 Also, visit backstage areas to see more about how the magic is created. The tour price also includes an exclusive commemorative pin. Starting Location: Outside of Epcot at Guided Tour sign. Walking tour primarily outdoors. No sandals, open-toe, or open-heel shoes will be permitted. 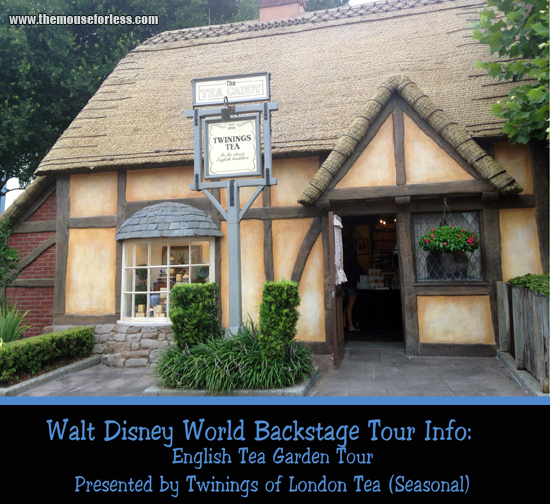 Take a look at the history of tea and learn about blending teas to creature unique and interesting flavors during this Flower & Garden Festival favorite. Presented by Twinings of London Tea. Wild Africa Trek is an immersive experience offering a unique opportunity to enjoy unexplored areas of the Harambe Reserve while experiencing with intriguing African wildlife. While trained guides lead, begin in the Safi River valley where expedition harnesses allow for crossing precarious rope bridges. Enjoy up-close views of Nile hippos and crocodiles. Continue along the edge of an African savannah, and board a specialized vehicle for an exclusive safari, including a stop at a private safari camp. Guests will use a wireless headset in order to hear the guide at all times. Cameras and video cameras are allowed if securely fastened to the vest but no backpacks are allowed. Lockers will be available for Guest to leave their personal belongings while on the tour. 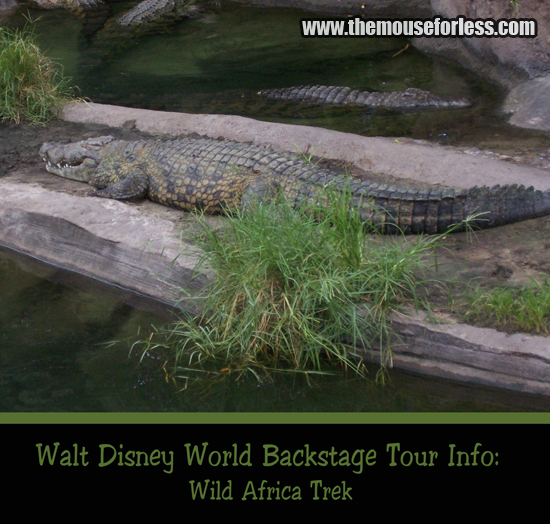 A portion of the Tour price is also donated to the Disney Worldwide Conservation Fund. Days & Times: Daily at select times during the morning and early afternoon. 12 spaces are available each tour, so reserve your spot early. Approximately every 45 minutes between 8:00 am and 2:30 pm. Price Range: $189.00 per person, plus tax; $249 per person, plus tax during peak season; includes photo CD, food & beverage and complimentary souvenir. Restrictions: Ages 8 and up (however under 18 must be accompanied by an adult); Weight restrictions between 45 lbs – 300 lbs apply with harness gear on; Minimum Height 48″/122 cm. Guests will be required to step on scale prior to harness issue. Also, certain body shapes may prevent the safety harness from fitting properly. Closed-toe shoes with a back strap or hiking boots required due to the rugged terrain on the tour. No flip-flops will be allowed. Everyone will wear safety equipment that is issued on the tour. Wild Africa Trek is an outdoor physical journey requiring stamina, surefootedness and comfort with heights. Guests should also be in good health and free from high blood pressure, heart, back or neck problems, motion sickness or other conditions that could be aggravated by this adventure. Expectant mothers should not participate due to the requirements of the tour. There are no bathroom breaks for 2 hours. Waivers must be completed at check in for all participants. Guests seeking a less strenuous or wheelchair-accessible trek should contact Wild Africa Trek operations at (407) 938-1373 for alternative programs. Basically, the first 90 minutes is spent with a guide on the Pangani Trail with information, photos and possible special happenings. Guests on the restricted tour then join the regular tour on the Safari Truck and continue to do the remainder of the regular Tour. The price is the same for either version of the tour. 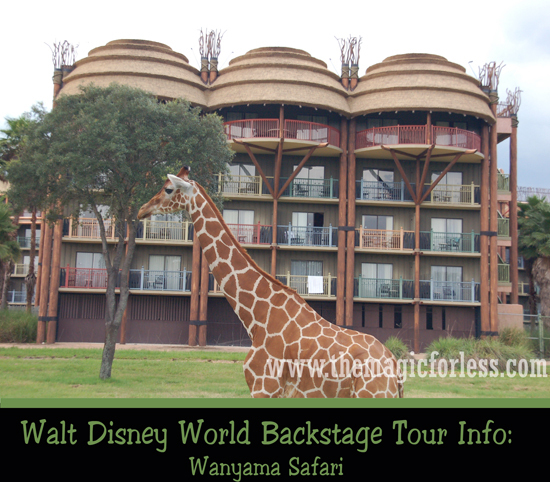 Starting Location: Guests will meet at the Kilimanjaro Safaris FASTPASS distribution area. Excursion occurs rain or shine, but may be cancelled due to severe weather or lightning. 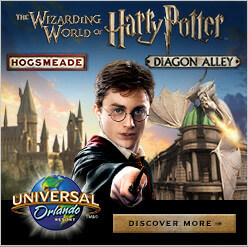 To Reserve: Call (407) WDW-TOUR or (407) 939-8687 up to 90 days in advance. Plus, you’ll get to take a break with signature snacks and a specialty beverage (nonalcoholic or alcoholic for Guests 21 and older). This is an outdoor walking tour – dress appropriately. The tour will occur rain or shine unless deemed unsafe. Restrictions: Guests under 17 years of age must be accompanied by a participating adult (18 years of age or older). Discounts: Annual Passholders, Disney Chase Visa Cardmembers and Disney Vacation Club Members qualify for a 15% discount. To Reserve: Call (407) 939-PLAY or (407) 939-7529. Get a closer look at the majestic African elephants at Disney’s Animal Kingdom—and learn what it takes to care for them. During this tour, you’ll meet with dedicated animal specialists who provide for the care and wellness of the African elephant herd. They’ll give you a glimpse into their day-to-day responsibilities as they provide fascinating facts about the elephants. In addition, African cultural representatives will share stories of Disney’s conservation efforts dedicated to the preservation of wild populations. During the tour, Guests will be able to observe the elephants from approximately 80 to 100 feet away. You’ll have the opportunity to be closer to the elephants than you would during other in-park experiences. This is primarily an outdoor tour. Please dress for the weather and wear comfortable shoes. Restrictions: Ages 4 and up. Guests under 18 years of age must be accompanied by a participating adult (18 years of age or older). Starting Location: Check in at the Curiosity Animal Tours kiosk, located across from Kilimanjaro Safaris entrance approximately 15 minutes prior to tour start. 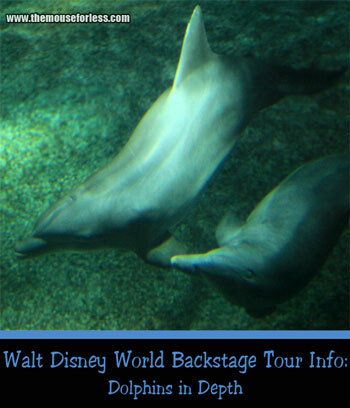 To Reserve: Call (407) WDW-TOUR or (407) 939-8687. Get ready for your close-up with the white rhinoceros. In this guided adventure, the rhinos’ keepers will take you backstage to meet these massive creatures as few people ever do. As your guides introduce you to the park’s white rhinos, they’ll offer fascinating insights into the species’ behavior and biology and discuss the challenges that threaten populations in the wild. Days & Times: Daily at 11:00 a.m. 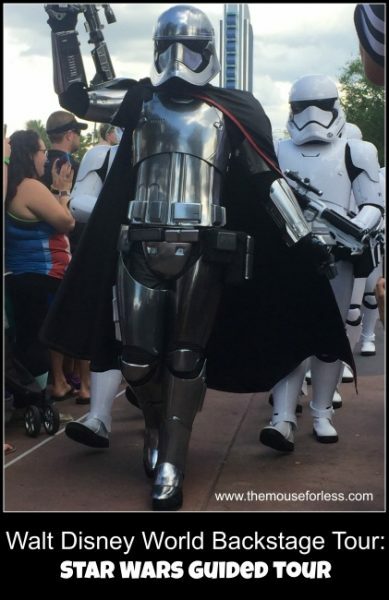 This experience will provide a VIP all-access adventure to all the Star Wars attractions. You will view a screening of the movie Star Wars: Path of the Jedi, have a reserved viewing area of 2 live stage shows- Star Wars: A Galaxy Far, Far Away & March of the First Order, and guest ages 4-12 will be enrolled in Jedi Training: Trial of the Temple. Everyone will climb aboard Star Tours- The Adventure Continues and enjoy a Star Wars-inspired dinner at Backlot Express. A visit to Chewbacca and Kylo Ren as well as view replica props, models, concept artifacts at Star Wars Launch Bay are included. Top off the night watching the Star Wars: Galactic Spectacular with a reserved viewing location. Days & Times: Daily, 8:00 a.m.
To Reserve: Call (407) WDW-PLAY or (407) 939-7529. Accompanied by a holiday host, visit Epcot for a performance of the inspiring Candlelight Processional, a retelling of the Christmas story brought to life by a 50-piece orchestra, mass choir and also a celebrity narrator. 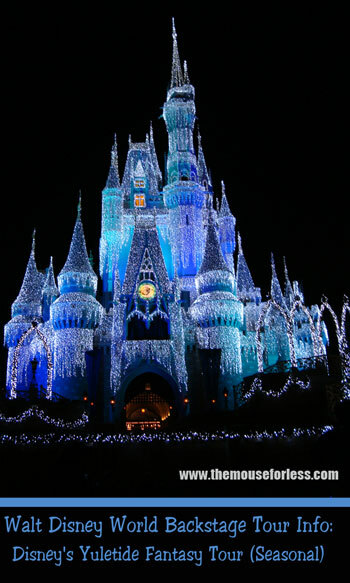 Travel to Magic Kingdom to admire the majesty of Cinderella Castle, which appears to be a crystalline ice palace, courtesy of some very special lighting. Turn “ho-ho-ho’s” into “ha-ha-ha’s” as you experience the “Jingle Cruise”—a.k.a. the world-famous Jungle Cruise, infused with festive sights and plenty of holiday puns during the holiday season. Also visit the the Decorating Support building and learn what it takes to transform the entire destination into a winter wonderland. Headsets and receivers aid guests in hearing guides during tour. Enjoy an early, family-style barbecue dinner also included with your tour. Guests also receive a Holiday D-Lights collector pin. Days & Times: Seasonal on select dates in November and December beginning at 4 p.m.
Park Admission: Not Required (or included). Starting Location: First report to Guest Services at the entrance of Epcot. Walking tour is primarily outdoors. Also, no sandals, open-toe, or open-heel shoes will be permitted. 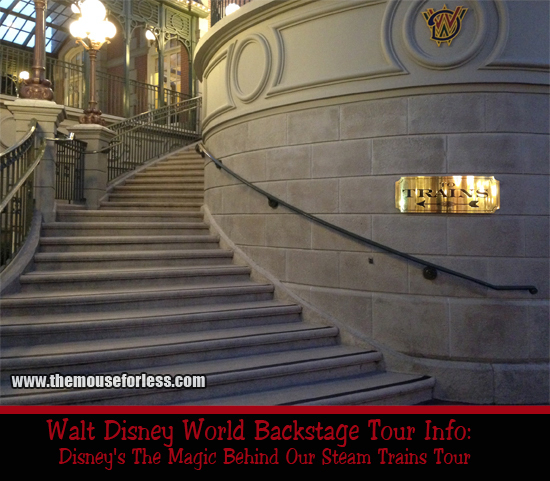 This tour provides a detailed peak behind the theme park magic, and also includes access to the legendary underground Utilidors. 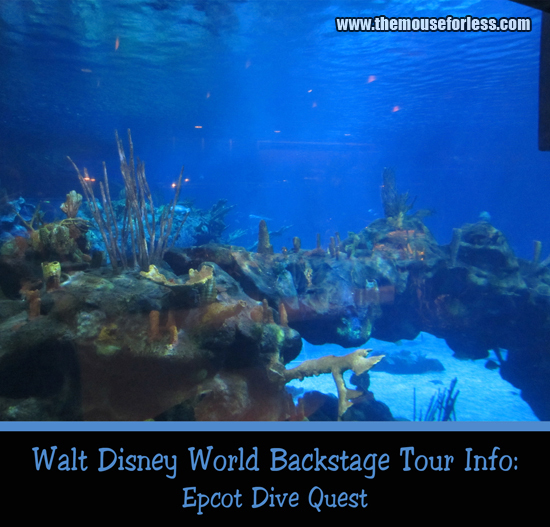 The behind-the-scenes adventure includes stops at Epcot, Disney’s Animal Kingdom, Central Shops, Creative Costuming, Textile Services, and the Magic Kingdom. 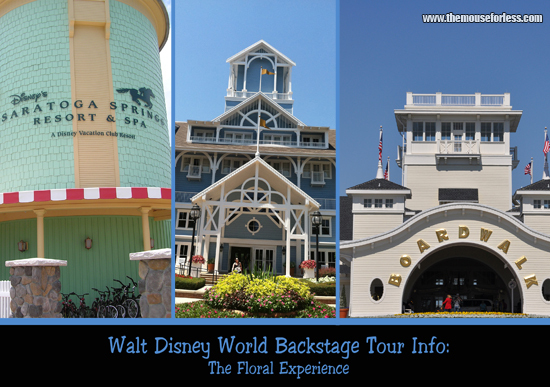 Through this tour, you will get a rare glimpse of astounding effort it takes to maintain Walt Disney World Resort. Each Guest also receives a special gift! Park Admission: Not Required (or included). Lunch at Tiffins inside Disney’s Animal Kingdom is included; Bottled water is also included. Restrictions: Ages 12 and up; No sandals, open-toe or open-heel shoes will be permitted. Starting Location: Report to silver-and-blue “Epcot Guided Tours Meeting Location” sign to the far right of Epcot Main Entrance at 8:45 am. Walking tour is primarily outdoors. Also, no sandals, open-toe or open-heel shoes will be permitted. 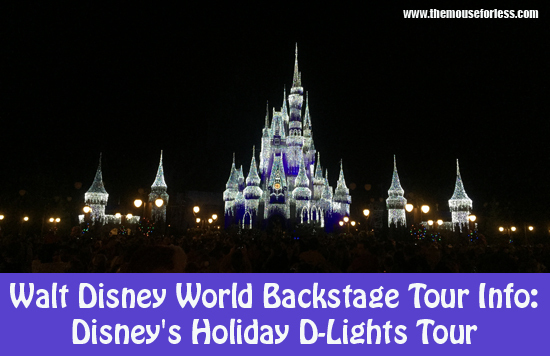 Tour behind the scenes at Epcot, the Magic Kingdom, Disney’s Hollywood Studios and the Grand Floridian to learn how holiday Magic is created at Disney World during the holiday season and all year around. You’ll also get a visit to the visit to the Holiday Services warehouse where holiday decorations are stored. During the tour, wireless headsets help to hear your guide in crowded areas. Transportation from location to location is by bus. No cameras in backstage areas. Days & Times: Mon thru Sat at 9:00 am & 1:30 pm, November 28th thru December 30th. No Christmas day tours. Price Range: $99 per person, plus tax; also includes a special holiday gift and snacks. Restrictions: Ages 16 and up. Photo ID required. Starting Location: Report to silver-and-blue “Epcot Guided Tours Meeting Location” sign to the far right of Epcot Main Entrance. Walking tour is both indoors and outdoors. Also, no sandals, open-toe or open-heel shoes will be permitted. This special tour is all about the family, especially those with children under 10 years of age. During this tour, which features family-friendly attractions begins in the Magic Kingdom, guests enjoy “it’s a small world”, The Barnstormer, Buzz Lightyear’s Space Ranger Spin, Magic Carpets of Aladdin, Peter Pan’s Flight, Tomorrowland Speedway, Dumbo the Flying Elephant, and Under the Sea ~ Journey of the Little Mermaid. From there, guests will enjoy a table service lunch at a Disney resort during this break from riding. Next, the tour continues to Disney’s Hollywood Studios where you enjoy Disney Junior Dance Party! and Toy Story Mania! The tour concludes with Festival of the Lion King and Kilimanjaro Safaris at Disney’s Animal Kingdom. Backstage photography restrictions apply during those portions of the tour. Restrictions: Photo ID required for adults. Under 18 requires an adult. ECVs are not permitted. Starting Location: Report to Tomorrowland Terrace in the Magic Kingdom. Walking tour is both indoors and outdoors. To Reserve: Call (407) WDW-TOUR or (407) 939-8687. Reservations can be made up to 180 days in advance. This tour has the thrill-seeker in mind. This VIP tour starts at the Magic Kingdom. During your time here, you have the opportunity to ride Big Thunder Mountain Railroad, Splash Mountain, Space Mountain, Haunted Mansion, Seven Dwarfs Mine Train, and Pirates of the Caribbean. Then after lunch at a table service location at one of Disney’s resorts, the tour will continue onto Hollywood Studios where guests get to enjoy the thrilling rides of Rock n’ Roller Coaster, Star Tours, Tower of Terror and Toy Story Midway Mania. Finally, the day ends at Disney’s Animal Kingdom where guests will get to ride Expedition Everest and DINOSAUR. Backstage photography restrictions apply. Restrictions: Ages 10 and up. Minimum Height 48″. Photo ID required. Under 18 requires an adult. ECVs are not permitted. To Reserve: Call (407) WDW-TOUR or (407) 939-8687. Guests can make reservations up to 180 days in advance. VIP Tour Services offers personalized tours for up to 10 guests looking for the perfect Walt Disney World Resort vacation. 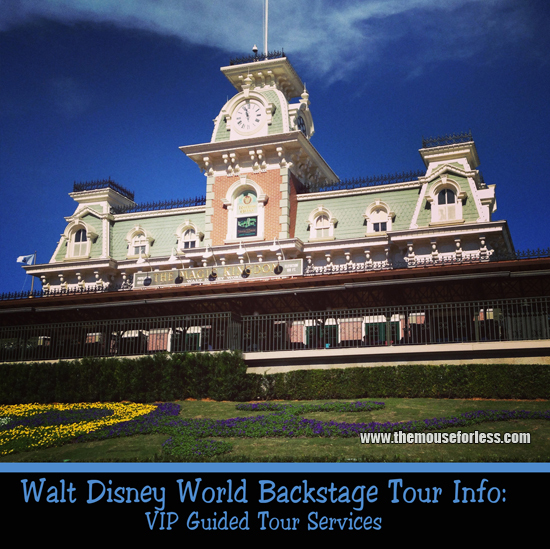 During a VIP tour, from the moment you arrive your personal VIP guide is there to take care of everything—from creating your ideal itinerary to getting you the best seats in the house for live shows, parades and nighttime spectaculars. During your time with your guide, your focus is only on enjoying the experience. Days & Times: Anytime of day, 7 hours prior to park closing. Price Range: $400 to $600 per hour, plus tax (depending upon time of year and whether guest is staying at a Disney resort or non-Disney resort hotel). Private transportation is available during the tour at an additional cost. Hefty cancellation fees apply. To Reserve: Call (407) 560-4033 up to 90 days in advance. Must be reserved at least 72 hours in advance. 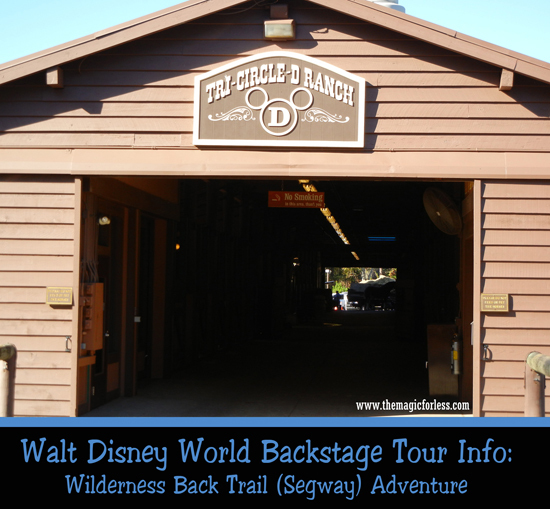 See the the stunning surroundings of Disney’s Fort Wilderness Resort along back wooded trails on a Segway X2 Personal Transporter. Various terrains are encountered such as sand and wood chip paths as well as various wildlife. Training is provided before tour and helmets are provided. Mid-tour there is also a stop at the Tri-Circle D Ranch. Also, guests should bring cameras. Class size is limited to 10 guests, so book early to ensure availability. Days & Times: Tues, Fri, Sat at 8:30 am & 11:30 am. No Disney transportation is provided for the 8:30 am tour. For the later tour use Disney’s internal transportation from any park or Disney Springs to Fort Wilderness parking; you will then need to transfer at the parking lot to a Fort Wilderness bus. Price Range: $90 per person, plus tax; includes bottled water. Restrictions: Ages 16 and up. Photo ID required. Weight must be between 100-250 pounds. Signature of parent/guardian also required for ages 16 and 17. Expectant mothers and also those with special needs should forego this tour or check regarding additional restrictions. Helmets provided and required. Flip-flops, sandals or rocker/exercise-type shoes (e.g., Skechers Shape-Ups) will not be permitted as these are not compatible with the Segway. Starting Location: Report to Meadows Bike Barn in Fort Wilderness Resort and Campground 15 minutes prior. Tour is both indoors & outdoors. To Reserve: Call (407) WDW-TOUR or (407) 939-8687. Only a portion of the tour may be cancelled due to inclement weather. In that event, Guests will receive a 50% price adjustment. The first portion of the tour will be held in a covered pavilion, rain or shine. Tour the savannas of Animal Kingdom Lodge with members of the Lodge’s animal programs team as your guides. You’ll board special viewing vehicles that also allow you stand up during the tour to get a better look at the animals. You’ll also have the opportunity to take unique photos. Days & Times: Daily at 4 p.m.
To Reserve: Call Animal Kingdom Lodge Resort Itinerary Planning Office at 407-938-4755. May be reserved 180 days. Description: During your safari, join an Animal Programs cast member on an hour-long safari of the Sunset Savanna at Animal Kingdom Lodge and Villas. 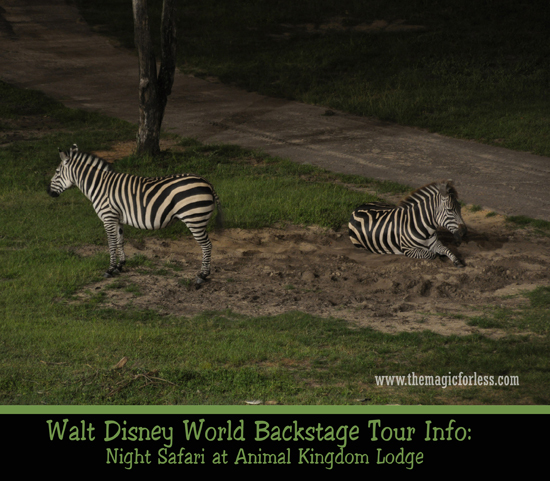 Through the use of night vision goggles, guests will see the animals while enjoying resort in a whole new way. Days & Times: Wednesdays and Sundays at 9:45 p.m.
Price Range: $70 per person. Restrictions: Ages 8 and up. Restrictions: All ages are welcome but a supervising adult must accompany children. To Reserve: To register and confirm location, call 407-WDW-PLAY or 407-827-3505. You must register at least 24 hours in advance to confirm your supplies for this fun experience. Description: Explore the people, food, art and animals of Africa during this tour at Animal Kingdom Lodge. Begin with a delicious breakfast at Boma hosted by a Cast Member who hails from the African continent while you enjoy exclusive dishes and stories of the details of the authentic stories and architecture of Animal Kingdom Lodge. Following breakfast is a backstage safari tour onboard a safari truck. Be on the lookout for some of the Lodge’s savannah residents such as giraffe, okapi, ostrich and red river hogs. Days and Times: Tuesday and Saturday mornings only beginning at 7 a.m. Restrictions: Guests must be at least 10 years old to participate. This experience features a ride in a rugged safari vehicle over an open savanna. So for your safety, you should be in good health and free from high blood pressure; heart, back or neck problems; motion sickness or other conditions that could be aggravated during this adventure. Expectant mothers should not participate. 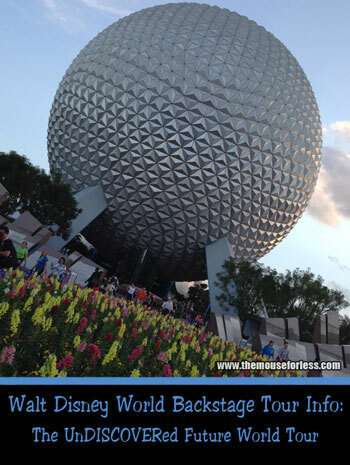 To Reserve: Call 407-WDW-TOUR. Each tour is limited to no more than 12 guests, so book early. Unschooled in the fine art of surfing? Novices can catch a wave and master the rush of shooting the curls at Disney’s Typhoon Lagoon water park. Every 90 seconds, the world’s largest wave machine blasts out walls of surf that can tower up to six feet high. Cocoa Beach Surf School invites guests to learn from professional surfers how to cut, carve and “hang 10.” Only 12 students per class, so make reservations early. 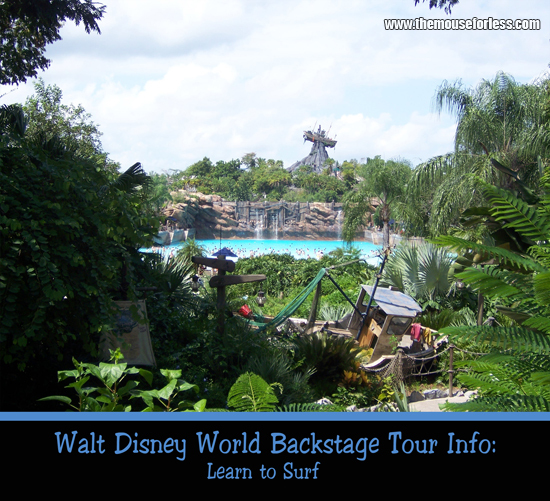 To Reserve: Call (407) WDW-PLAY or (407) 939-7529; You can also email WDPRSurfingPrograms@email.disney.com. Grand 1, the most luxurious watercraft at Walt Disney World, offers a pampered VIP boating experience on the waters of Seven Seas Lagoon and Bay Lake just outside Magic Kingdom. A personal captain and deckhand launch the 52-foot Sea Ray yacht from the marina at Grand Floridian Resort. Morning and afternoon excursions offer guests a view of Magic Kingdom, Disney’s Wedding Pavilion and several Walt Disney World resorts. For an elegant evening voyage, romantic music sets the mood as the sun sets over the gabled roofs of the Grand Floridian. On select nights, cruisers can view “Happily Ever After,” fireworks display above Magic Kingdom. While on board, guests enjoy synchronized audio from the show. For the ultimate cruise, Grand Floridian private-dining staff can also prepare anything from an evening snack to a gourmet five-course meal with fine wine pairings. Private-service butler can also cater to guests’ every need. Price Range: $553 per hour for up to 18 guests, plus tax; including charter fee, boat captain and deckhand. Dining service and private butler are also available for additional fees. During this adventure, little landlubbers (ages 4 to 12) go on a two-hour hunt for treasure and adventure on the high seas of Disney’s Seven Seas Lagoon and Bay Lake located at Disney’s Grand Floridian Resort. At the final stop, the little pirates split the treasure while enjoying a snack (goldfish crackers or pretzels) and a drink (water or juice). Since the number of pirates is limited, this adventure requires advanced reservations. Days & Times: Mondays through Saturdays, 9:30 a.m. – 11:30 a.m.
-Albatross Treasure Cruise at Yacht Club Resort on Monday, Wednesday, Friday 9:30 – 11:30 a.m.
-Bayou Pirate Adventure Cruise at Port Orleans Riverside Resort on Sunday, Tuesday, & Thursday 9:30 a.m. – 11:30 p.m.
-Island of the Caribbean Pirate Adventure at Caribbean Beach Resort on Sunday, Tuesday, Friday 9:30am – 11:30am. Price Range for all: $36.21 per child (includes tax); includes lunch and also other surprises. Restrictions for all: Children ages 4 to 10 only; Also, children must be potty trained. To Reserve: Call 407/WDW-PLAY up to 180 days in advance. Days & Times: Fridays through Mondays evenings, one hour and 15 minutes prior to the scheduled fireworks spectacular. Restrictions: Guests under 16 years of age must be accompanied by a paying adult (18 years of age or older). Starting Location: Disney’s Contemporary Resort. Please arrive 10 minutes early so you can check the Daily Events Board in the lobby to find out exactly where to meet. To Reserve: Call 407/WDW-PLAY. Same-day bookings are allowed, if available, up to one hour prior to the experience.